When I see a biography, I always wonder, why did producers choose this story to tell? There is never just one story. There are multiple perspectives and events a producer could focus on. A 2 hour 13 minute movie can only cover so much of an artist and a band’s legacy. So I wonder about the rhetorical choices made in the production of this movie. 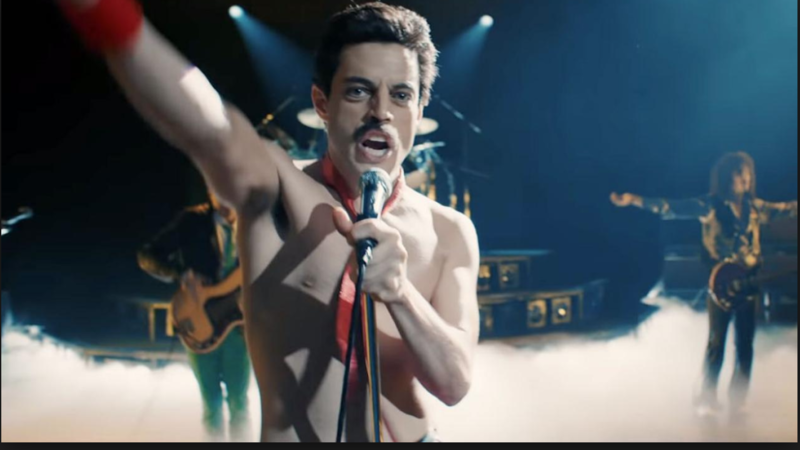 I appreciate that there are a lot of layers to the movie: Freddie Mercury’s (Queen’s lead singer’s) sexuality, AIDS diagnosis, how he passed as white, his flamboyant persona, and his struggle with loneliness, identity, and belonging. 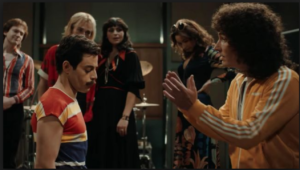 Even though the movie covered a lot of ground, it missed an opportunity to explore difficult subject topics like the AIDS epidemic and gay culture and relationships. 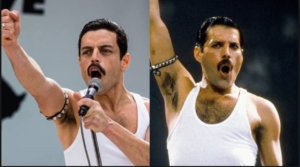 Mercury is one of the most famous people to ever die from an AIDS related complication. Yet, the movie sensationalizes his battle with AIDS. There’s a brief scene in which he coughs up blood, but other than that, he is not shown to be significantly affected by the disease. In reality, AIDS is an absolutely horrifying and ugly disease that demolishes your immune system. For these reasons, there’s been a lot of controversy about Bohemian Rhapsody. 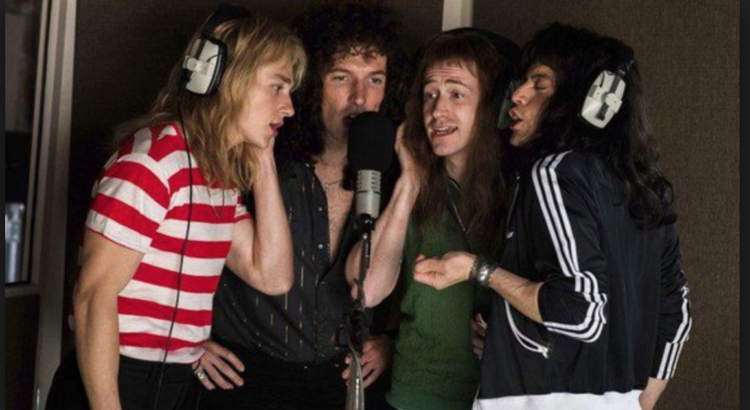 It sounds like producers tried and succeeded in interview the surviving members of Queen and some important people in Mercury’s life. But the movie, as most movies are not, perfectly historically accurate. The movie has also been accused of straight-washing. Mary Austin was his lover before he fully realized he was gay. When he came out, he and Mary remained close friends. The film did not dive deeply into his relationships with other men, and instead, foregrounds his relationship with Austin. 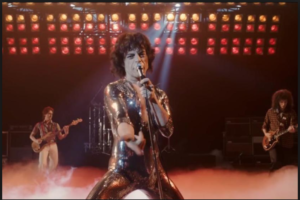 The movie does however, depict Mercury as being sexually liberated: having a lot of different sexual partners and hosting promiscuous parties. Eventually, he met Jim Hutton who was his romantic partner until he passed away in 1945. I think it is worth noting that in real life, Mercury was partners with Austin and Hutton for roughly six years each. Thus, I would argue, his connection with Hutton and Austin, are equally important. So it feels a little lopsided that Hutton was not a fully realized character in the movie and that he only showed up in two scenes. Austin’s character, on the other hand, was much more fully realized and important in the movie. I thought it was very powerful to have her support Mercury when he came out. But I felt her character was eventually used to demonstrate how much of a jerk Mercury could be and how lonely he was. For example, when Austin started dating someone else and eventually became pregnant, Mercury became jealous. This scene showed a selfish and possessive side of him. Even though they could not be together romantically or sexually, he was not willing to fully give her up and have her pursue other relationships. 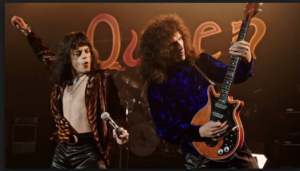 Overall, I thought it was an entertaining movie that gave the audience a taste of Queen’s rise to fame and Mercury’s personal struggles, but it missed a great opportunity to explore the AIDS epidemic and gay culture in America.